Hint: it involves the battery. Last week, Harry Metcalfe graciously showed us his gorgeous first generation Acura/Honda NSX. As one of our favorite supercars of the 90s, its namesake successor was naturally one of our most anticipated arrivals in recent years. We’ll admit the styling doesn’t work for everyone and we doubt it’ll age as nicely as its predecessors did. But the issue Metcalfe brought up today in his latest episode of Harry’s Garage is whether or not this new NSX delivers where it should. Metcalf’s criticisms were mostly familiar, namely some exterior elements and the disappointing infotainment system. He paid 180,000 GBP for his NSX, putting it very much in Ferrari 488 GTB and Lamborghini Huracan pricing territory. But what Metcalf was really hoping the NSX would turn out to be was sort of a mini Porsche 918 Spyder of sorts. Both are mid-engined and utilize electric motors, allowing for some pure EV driving capability. Unfortunately, Acura/Honda didn’t go far enough with the NSX’s battery. It really needed to be more powerful, according to Metcalfe. 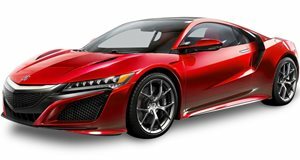 So is the NSX an underperforming exotic? To an extent, perhaps, but it’s also sort of a missed opportunity: a less expensive hybrid supercar that delivered the goods.